5 Bedroom Detached House To Rent in Maidstone for £4,995 per Calendar Month. 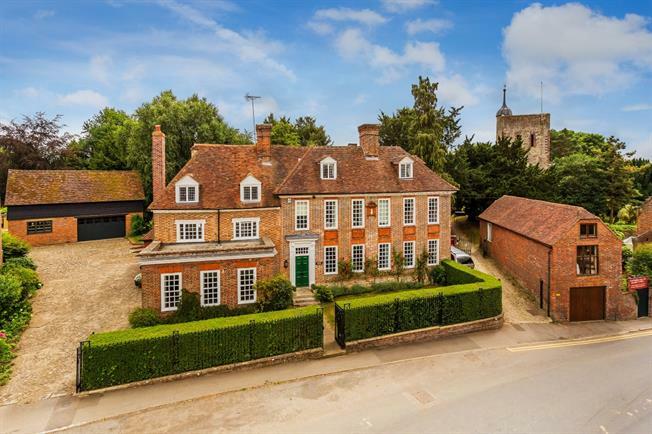 Church House is a fine Grade II Listed village house of importance in a quintessential village setting alongside the parish church. Its handsome exteriors reflect the early eighteenth century additions to the original seventeenth century house and include many architectural features of the period. Internally there are panelled walls to the reception hall and dining room, internal window shutters, some window seats, panelled doors and fireplaces of varying styles - throughout the house there are many outstanding and original features. Reception rooms are elegant, whilst the sitting room is perfect as an informal family living space. With access to the rear courtyard and fitted with granite work surfaces and a bespoke range of wall and floor cabinets, the kitchen/breakfast room has central island, a gas fired Aga and other integrated appliances, as well as a walk-in pantry. An elegant, easy rising staircase leads to the first floor, which is arranged to provide four bedrooms. The principal bedroom has a dual aspect with views to the front over the village and beyond, together with a dressing room and en-suite shower room. There are three further bedrooms - one with an en-suite bathroom ? and a bathroom on this level. The gardens are enclosed within a charming wall and have deep, well-stocked herbaceous borders containing a wonderful selection of colourful perennials and shrubs. The large, level lawn is peppered with majestic trees including an ancient yew, whilst there is a conservatory by Amdega with power and light connected and a brick and stone terrace with pergola over for outdoor entertaining.